I like technology. I like a clean house, especially when all the exertion it takes is to push a button. Being the early adopter than I am, I have a Discovery Series Roomba robot vacuum sweeper. Being the 400 series (they are now up to the 900 series), it isn’t the most powerful robot sweeper out there. I still like to use it to sweep our bedroom because I don’t have Superman strength to lift the furniture over my head to vacuum under it. Until the rechargeable battery died. As revolutionary as iRobot is to give us the first robot cleaners, the company’s customer service is as backward as you can get. The iRobot people at Blissdom were surprised my Roomba Red lasted so long because they don’t service or replace defective products. If you have issues with your Roomba they tell you to buy a new $800 robot to fix the problem. Seriously? To fix a dead battery? Lacey sheds like it is her job which puts researching a replacement robot vacuum sweeper that can handle dog hair on my massive To Do List. 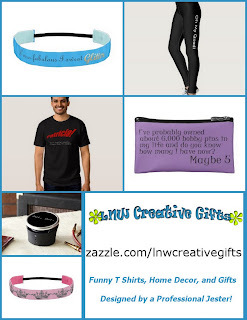 (If you have one you like let me know in the comments below!) 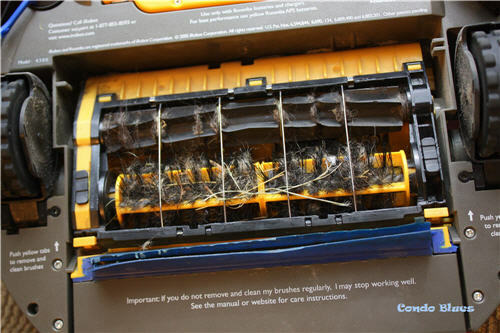 In the meantime, the quick and easy fix is to replace the Roomba battery and clean brushes for a miesly 33 bucks. First of all, shedding fur IS my job I’m a DOG! Secondly, Lisa cheaped out and didn’t buy the $69 official battery from Roomba but a $25 one from Amazon. Lisa doesn’t mind that doing this voids the warranty since her robot is old and Roomba won’t service it, but you might. What can I say? Lisa is a rebel. 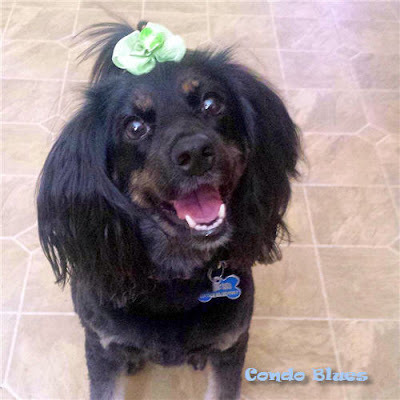 I have a hard time training her to behave. 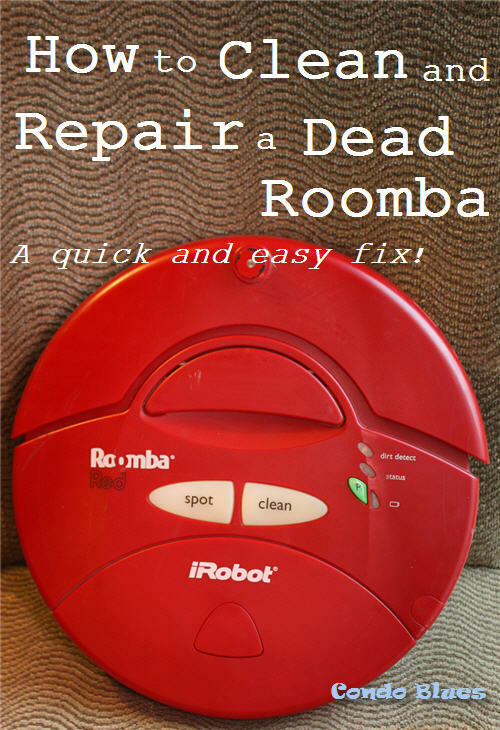 This tutorial and photos is for an Original Roomba. There are only slight differences on how to clean, and replace the battery and bent brushes on newer models. I will make notes on the difference where I can. Roomba Rechargeable Battery – You can buy it from Roomba or buy a replacement rechargeable Roomba battery for significantly less money from Amazon like I did. Roomba side brush – Roomba doesn’t sell 400 series side brushes or filters anymore. I had buy my Roomba side brushes and filters from Amazon here. 1. 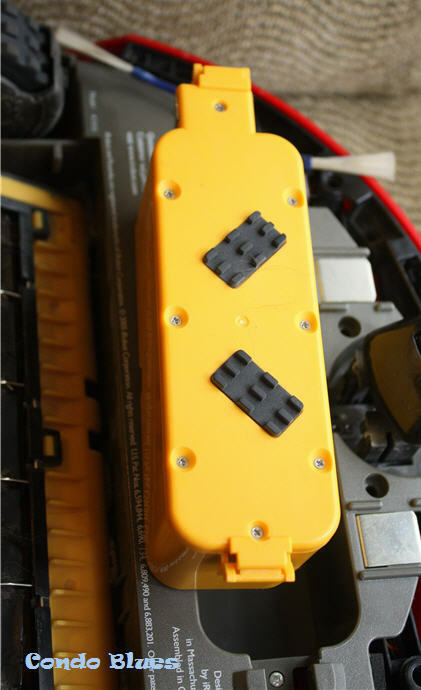 Flip the Roomba on its back and locate the battery compartment. Newer models will have an oval door covering the battery while older models like mine do not. 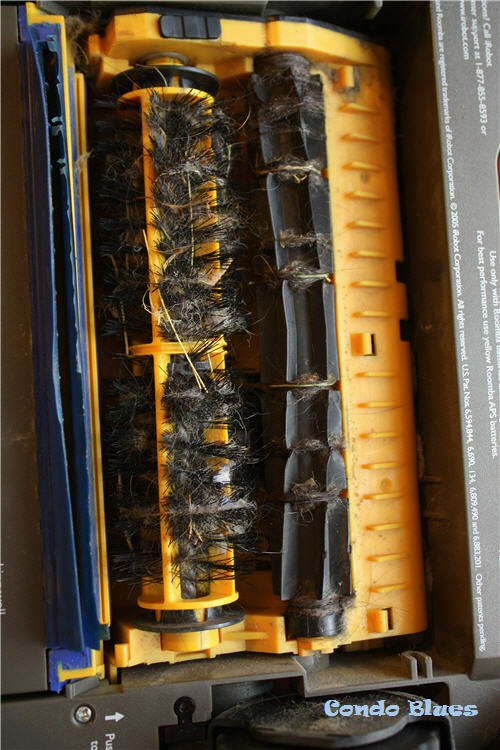 Dead robot vacuum battery, bent side brushes, a dirty filter, and epic loads of pet hair clogging the brushes. Let's get to work! 2. 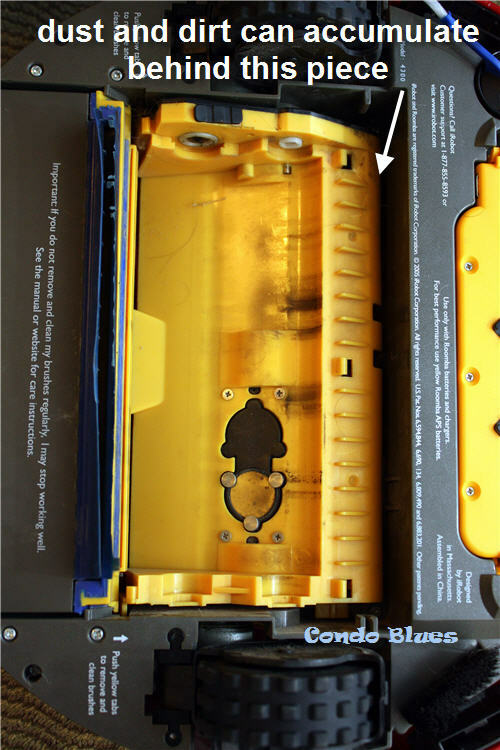 Older Model Roomba: Pinch the sides of the battery toward the center of the battery with your fingers and lift up to remove the battery. I am recycling this battery at Home Depot to keep it green! Newer Model Roomba: Unscrew and remove the battery door with a small screwdriver. Pinch the sides of the battery toward the center of the battery with your fingers and lift to remove the battery. 3. Drop the new replacement Roomba battery into the battery chamber to snap it into place. Newer Model Roomba: Use the screws and screwdriver to reattach the battery door. 4. Charge the new battery in the Roomba for 24 to 48 hours before using. The side brushes bend easily and will not push dirt into the vacuum path. 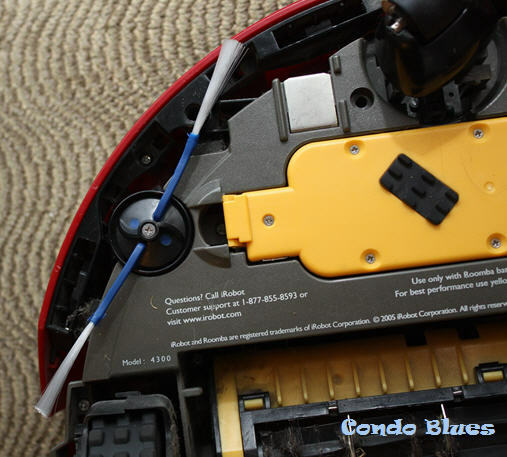 Replacing the brushes on your Roomba is quick and easy! 1. Flip the Roomba on its back and locate the side brushes. Original Roomba models have two side brushes. Newer Model Roombas have three side brushes. 2. Use the screwdriver to unscrew and remove the bent side brush. 3. Drop the new side brush on the empty spindle and use the screwdriver to screw it into place. 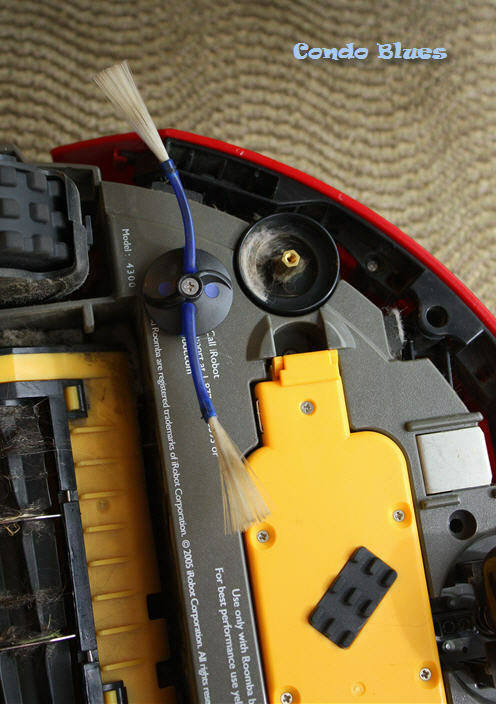 Just like every other vacuum cleaner on the planet, string, hair, thread, or mountains of pet hair can wrap around the beater and bissell brushes and cause your Roomba pick up less dirt. The tutorial for removing and cleaning Roomba bissell and beater brushes is the same as for how to replace Roomba brushes, minus the cleaning step. 1. 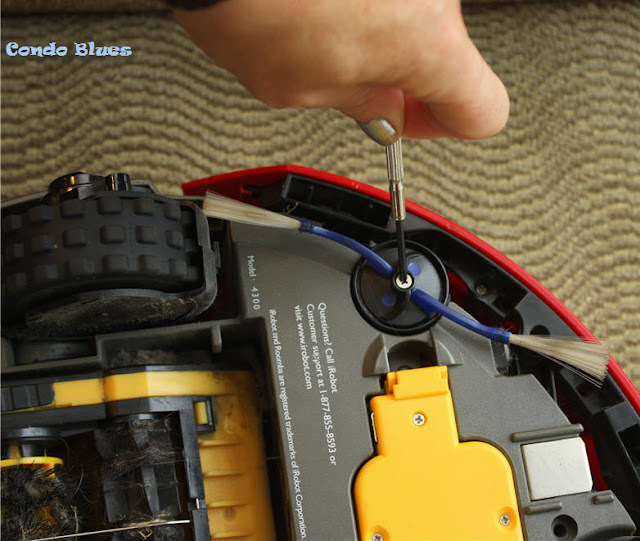 Flip the Roomba on its back and locate the yellow tabs on the wire bale (also called the brush guard) over the bissell and beater brushes. 2. Pinch the yellow tabs with your fingers and remove the wire bale exposing the brushes. Yowza that's a lot of dog hair! Thanks Lacey. 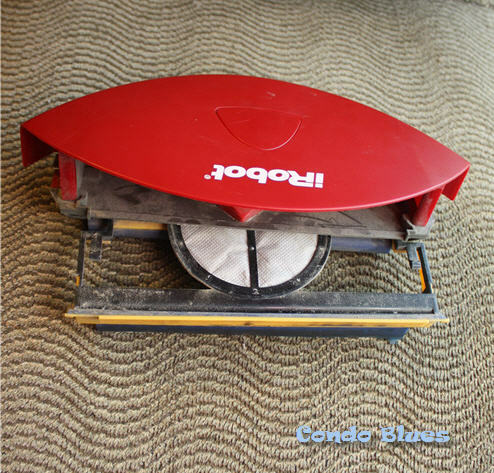 Older Model Roomba: Slightly tip/move the brush to the right or left to slide the brush out from the brush bearings. 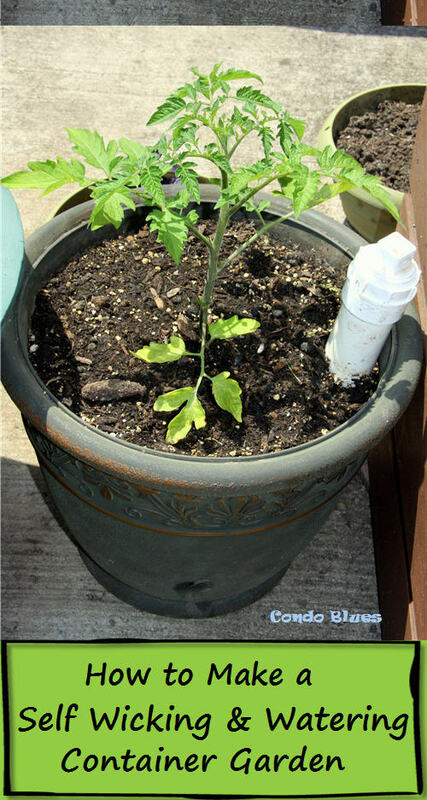 Warning: Do Not Remove the yellow brush housing the clean any dirt accumulated behind it. Blow the dust and dirt out with a can of compressed air if you cannot remove it using your hands. 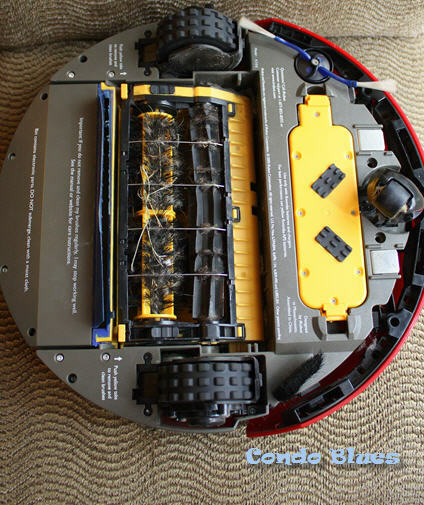 Newer Model Roomba: Push the yellow tabs on both sides of the brush to remove the brush from the Roomba. 4. Clean the string, hair, etc. from the brushes with your hands. In my case I found extreme dog hair wrapped around the beater brush (thanks Lacey!) I had to remove it by carefully cutting with a pair of scissors. Tip: Don’t forget to check the ends of the brushes where the Roomba and brush connect. I found a doughnut of dog hair wrapped around all four spindles. I also cleaned dog fur wrapped around the front wheel by popping it out with my fingers and snapping it back into place. Vroom! Vroom! Roomba is zippy again! Then I really got wacky and replaced the Roomba vacuum filter. Roomba doesn’t sell 400 and Discovery series filters anymore so I have to buy them from Amazon too. 5. Snap both brushes and the wire guard back into place with your fingers. Charge up your Roomba and get cleaning!